There are regular Sunday Services at St James's and also many other services, some of which take place regularly every week or every month and some just occasionally - see below for details. They are all entered into our church calendar on the What's on page. 08.00 Holy Communion: This is a quiet, reflective service of around 30 minutes at the beginning of the day, held at the high altar. 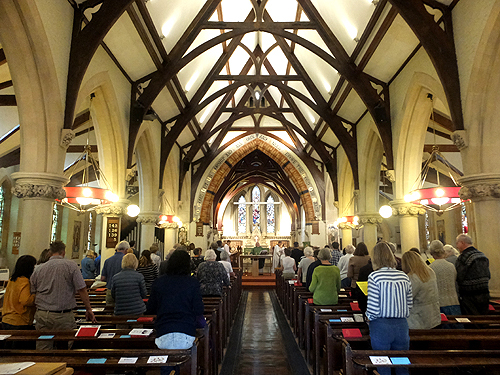 09.30 All Age Service: This is an occasional service specially aimed at family groups and younger members of our congregation but with everybody joining in. Both these 09.30 services are always followed by refreshments in the hall. 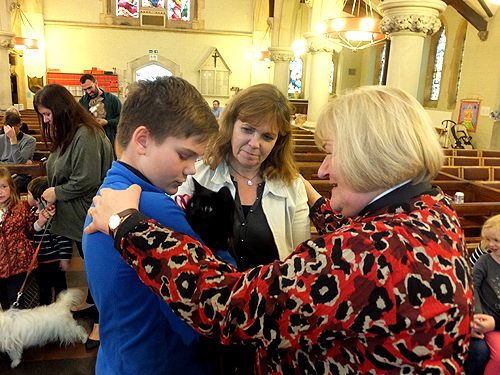 11.00 Together at Eleven: This is a short, snappy service especially for children and families, but everybody is welcome. This service does not take place when there is an All Age service. 09.30 Tuesday mornings: Holy Communion. This is a quiet, reflective service of around 30 minutes at the beginning of the day, held at the high altar. On the second Tuesday of the month this service starts at 10.00 and is followed by coffee in the church. 09.15 Monday, Wednesday, Thursday and Friday mornings: Morning Prayer. Prayer is offered every day, and this service of around 20 minutes is a way to start the day with reading the Bible, praying and spending a few minutes with God. Advent | Christmas | Epiphany | Candlemas | Lent | Ash Wednesday | Mothering Sunday | Palm Sunday | Maundy Thursday | Good Friday | Easter Day | Ascension Day | Pentecost | Trinity | St James's Day | Harvest Festival | All Saints' Day and All Souls' Day | Remembrance Sunday. At Christmas there is a Carol Service, Christmas Eve Crib Services, Christmas Eve Midnight Mass as well as a service on Christmas Day. 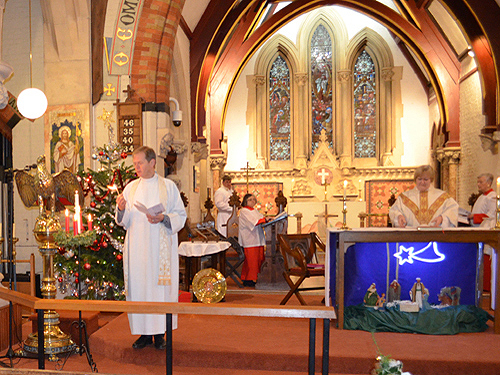 These and occasional services such as the Presentation of Christ in the Temple, or Candlemas are recognised with different services appropriate to the occasion. Sung Evensong is an occasional service sung for festivals and special occasions. Compline is said each Sunday in Lent at 2000, and every evening in Holy Week up to Maundy Thursday. The lighting of new fire is observed at dawn on Easter Day. All services are entered into our church calendar on the What's on page.